I am shocked at the obesity we are seeing - on the playground, in the shops, at the grocery store. 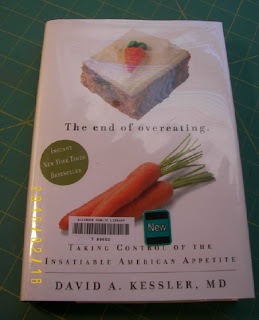 This book explains one major reason why the obesity rate is shooting up. In addition to life changes, FAT, SUGAR, and SALT are commonly added to our foods by the food industry, and they affect our brains/body to want MORE of everything! Some of us have been thinking this might be a contributer to obesity, but lack the background to investigate. The author is an MD, former Dean of Harvard Medical School, and also of Yale. The first half explains what is happening to our brains/body, how the manufacturers are taking advantage of body reactions to FAT, SUGAR, SALT, and huge proportions. He describes how these items are slid/sneaked into our foods under various names, hiding their presence. I would suggest this book to anyone who is struggling with guilt for overeating, or who is responsible for feeding families. The second part of the book gives suggestions for combatting this overpowering industry that wants us to eat MORE, MORE, MORE, affecting out brains to demand MORE, MORE, MORE! ... and I admit, I was drawn to the book because of the photo of the Carrot Cake! I weighed 10 1/2 lbs. at birth and have been struggling since childhood to keep my appetite in check, and feeling guilty most of that time. It is a new book and on the New York's Best Seller list. Now, for something quilty, FINALLY... a Pineapple Blossoms in progress. The colors are a bit brighter in person, and I've used almost all stash. It was looking a bit 'blah' so I added the fushia, and bright blue here and there. There will be horizontal sashing yet to make, with light cornerstones. 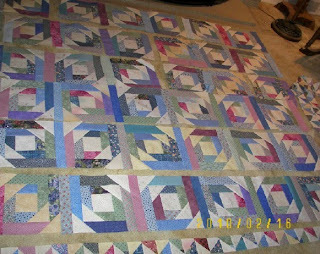 And YES, I saved the cut-off triangles, trimmed them to 2 1/2 inches - a perfect border! This is from Bonnie Hunter's Quiltville.com Quiltville.com which she taught last month in Casper, Wyoming, and where I finally had the pleasure of meeting her. I'm only allowed to sew (and blog) for short periods of time due to this pesky pinched nerve thing which is taking waaaaaay too much time and energy for my liking! Your so right about the over weight kids and adults . I have to watch what I eat and move my body everyday to lose weight. One thing I have learned is eating out is NOT good if your trying to lose so weight. We are all better off cooking at home and from scratch not from boxes . It took me a few minutes to realize that what I thought were the tan sashing strips were really your carpet. These bifocals will be the death of my sanity!! Are you interested in making a spool quilt and swapping 25 blocks with me? See my blog for details! Ohhh, this quilt is lovely. The colors are so great. The fuschia and blue really gives it life. You're paper piecing it, no? I feel for ya with that pinched nerve. Hope it's all better soon! That book looks interesting. The excess sugar fat and salt are three reasons why I like to make from scratch as much as possible. Another reason for childhood obesity is TV/computer/video time. I did an informal survey in my Grade 3 class while I was teaching and lots of kids spend 90% of their spare time sitting in front of one of the above. The pineapple quilt is beautiful. Interesting looking book. What I find appalling is the amount of salt consumed in this country. No wonder so many have problems with high blood pressure in this country, including children now. Your way with color is always so great. I love the way your new quilt looks. Good luck with the pinched nerve, my husband is dealing with one also. Very pretty - how big are the blocks? Great color choices - This is one of Bonnie's that I want to try some day. Watch this video (Bitter Truth) on You Tube, and it will reinforce the message of the book. Some of it is technical, but continue watching. Love your quilt, Elaine! The colors are perfect. As for the book, MSG is a big factor in creating an increased appetite. Our son did some research and the results were appalling. Since then, we have eliminated it, but this is difficult. It is in so many foods. Sugar too. Why do they add it to frozen vegetables, for instance! Your Pineapple Blossoms is going to be a beautiful quilt! I love your colors. We are on a life style change of eating habits.DH lost 25 lbs...me 14. We are eating lts of fresh veggies. It is more work to prepare food now but I do feel so much better. I am hooked on sugar in my tea...try to now eat it anywhere else. Love the quilt. Your colors are always so right on! And are you doing a spool block exchange?????????? It is a great Pineapple Blossom quilt. I like your border treatment. Hope you are feeling better. Very pretty quilt. Good for you for using those leftover pieces. I'll have to get that book for our library. Everybody should know how sneaky the food processors have become. Still, I eat a fraction of what my husband does and he's rail thin and I'm "fluffy"...where's the justice in that?? The pineapple quilt is turning out beautiful. Along with the rest of America, I try to watch what I eat. And I do cook at home a lot. We are trying to eat food that is better for us. What a struggle--it isn't the WAY we learned to cook years ago! You are so very right, dear Elaine. When I first started nursing 20 years ago, the obese pt was not the norm. Now we regularly see 500-600-700 pound patients, and lots of 300# people. I feel so bad for them...so many problems are just brought on by this. This is one reason why I have renewed my committment to Weight Watchers and eating well. I know it is so hard to lose weight, especially with all the artificial foods that surround us. I do not want my baby to have to deal with that problem with me when I age. Now...love the quilt! I love the way you put some brights in there, it just makes the quilt sing! Oh your pineapple blossoms is wonderful! I've heard about that book. He's on to something, I think. Beautiful quilt; you made a good call on the fuschia.